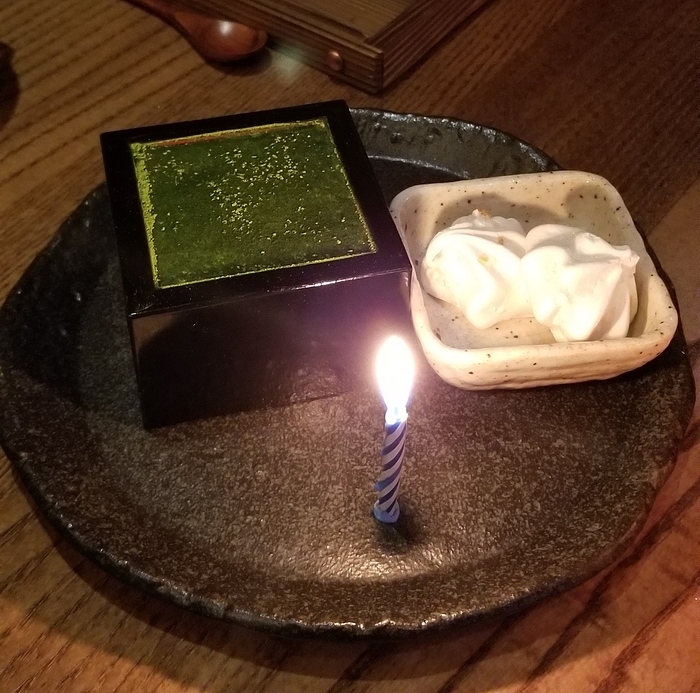 Celebrated a family birthday with a meal at Kamikura last night, all opted for the cha-kaiseki meal, which is 8 courses from their menu that evening. We had a few appetizers on top of the kaiseki meal too. Started with an order of roasted shishito peppers, a carpaccio bouquet (so beautifully plated! ), and a tofu and uni dish. Shishitos were good, but these are everywhere these days, so not going to elaborate. 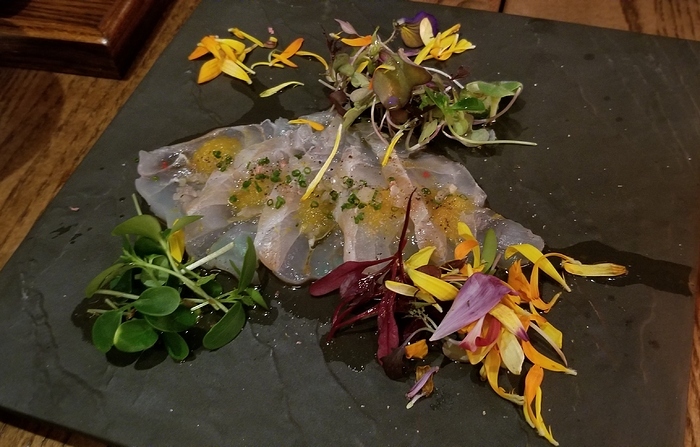 Carpaccio was fish sliced thinly -nearly translucent- and plated with a vinaigrette and edible flower petals. It really took after its name and was very tasty. The tofu and uni was super creamy and nice balance of soft, fresh tofu with pops of roe and savory uni. Strobe ranch wagyu (my DCs all upgraded to A5 wagyu, but I didn’t) with daikon and dashi butter – what’s not to like? 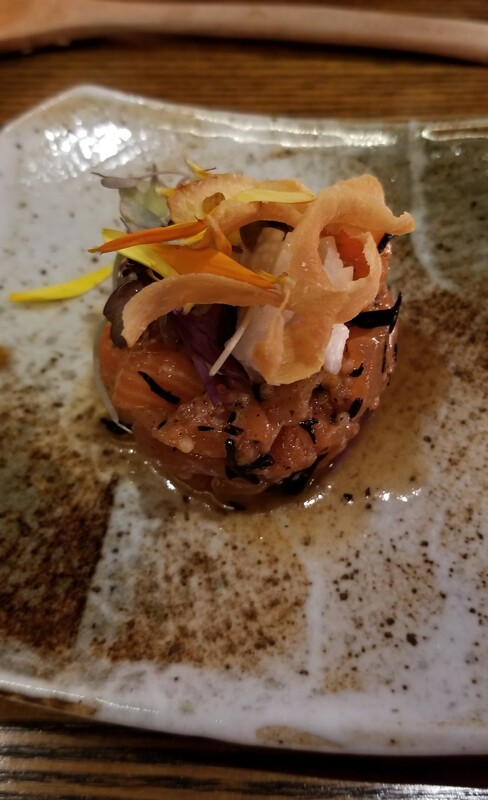 salmon tartar with hijiki and mountain yam – not too overwhelming with sesame oil and hijiki. i’ve usually had mountain grated into the slimy pulp, and this was diced into little crunchy bits. loved that texture! 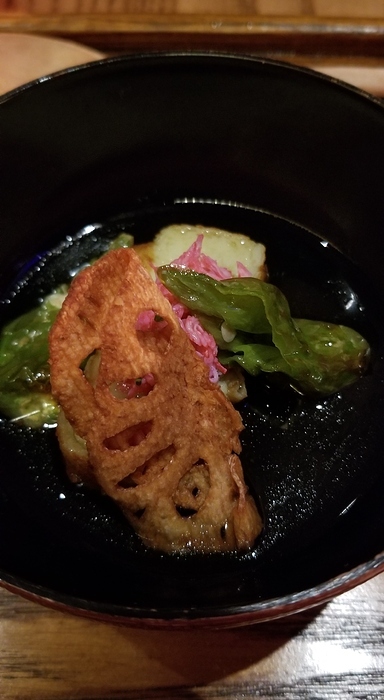 tempura fig in a creamy sesame and hamachi “pastrami” – the fig and sesame, we all wanted a 100 more. the sesame sauce we all scraped every last bit off the plate. crunchy onigiri with ikura and wasabi dashi broth – rice stayed crunchy even with the broth. The broth was soo good. Simple but we all loved, loved this. 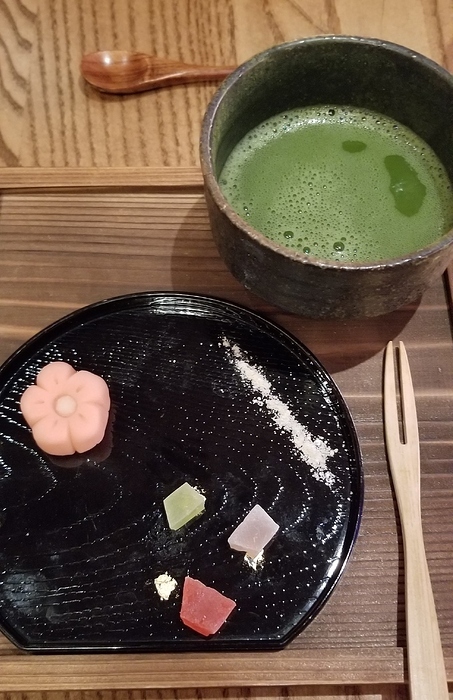 traditional flower shaped wagashi and matcha tea with candy “jewels” (not on the menu) – perhaps the only miss for me is that I don’t like traditional whipped matcha tea, but i appreciated the authenticity of ending the meal with this. the wagashi was fine, and i enjoyed the slightly crunchy and chewy jewels. another pretty dish! We found everything well flavored, and beautifully presented. It’s clear a lot of thought has gone into how everything was plated - simplicity and delicate in design. 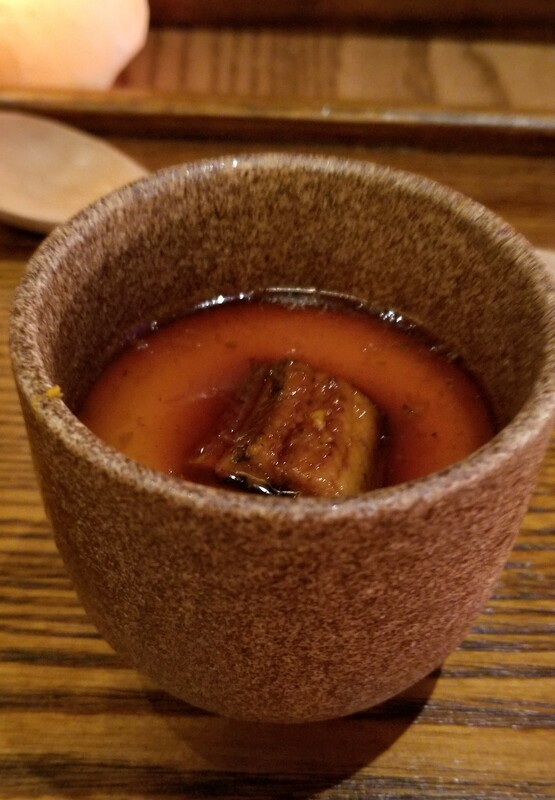 We were finishing the last drops of broth, dashi and sauce on the plates and bowls with every serving. 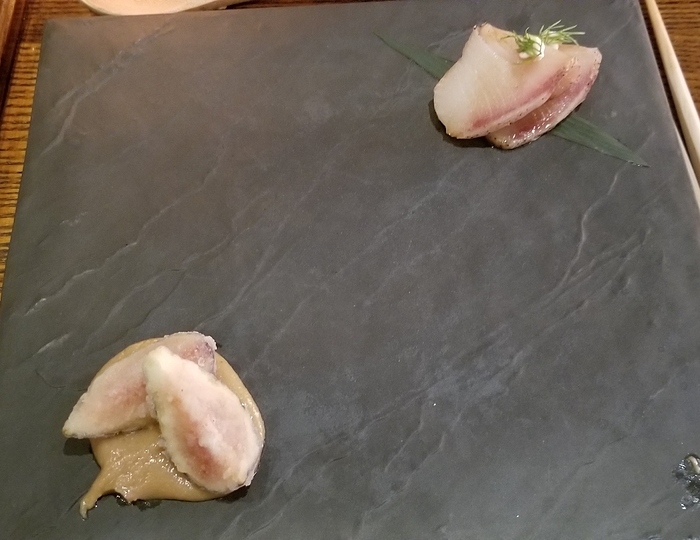 I can nitpick a few things on a few of the dishes, but I had a great time, and there is nothing like this in Boston that I’m aware of (the closest being an omakase at O-ya perhaps). It’s costly, but I would highly recommend it to those who don’t mind the splurge to give it a try. The space is comfortable and cozy, but a bit tight given the narrow-ish and square building. Has a modern, wood themed feel, so not going for the traditional Japanese restaurant ambience. 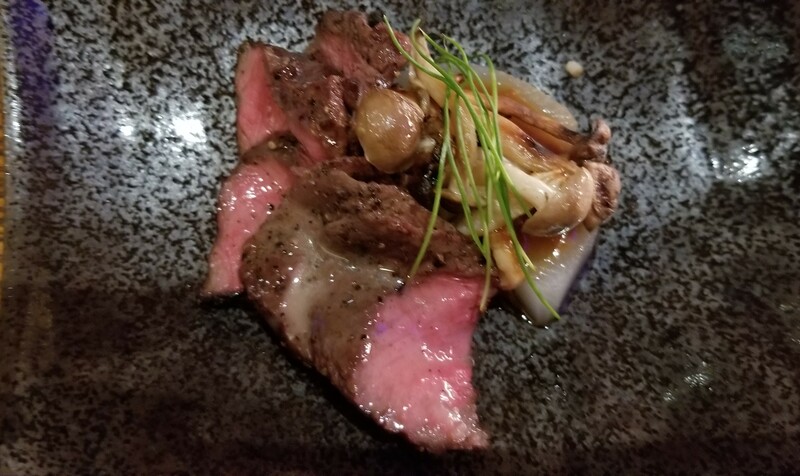 Service was great; attentive and not intrusive and the staff took their time to explain each dish. Drinks were top notch, and I had a fabulous non-alcoholic drink that might be my new favorite. Bathrooms require a trip up and down via elevator, which wasn’t a problem for a quiet, rainy Tuesday night. I can see this getting hairy if it’s busy. I have pictures, but can’t post now. Can try to get photos up maybe this weekend if you’re curious. What a report. Really appreciate the level of detail you have shared. Sounds like a fabulous evening! Fabulous report, kobuta! I think I feasted vicariously through your beautiful descriptions. .
What a fascinating, detailed report! Would love to see the pictures if you have time to post them; you have already been very generous with the lovingly detailed report. Pictures – sorry, don’t have good resizing software for photos. Enjoy! Wow, what an exceptionally gorgeous meal! Looks good, but doesn’t seem like it was enough food! Man, Frank, you must be a big eater. 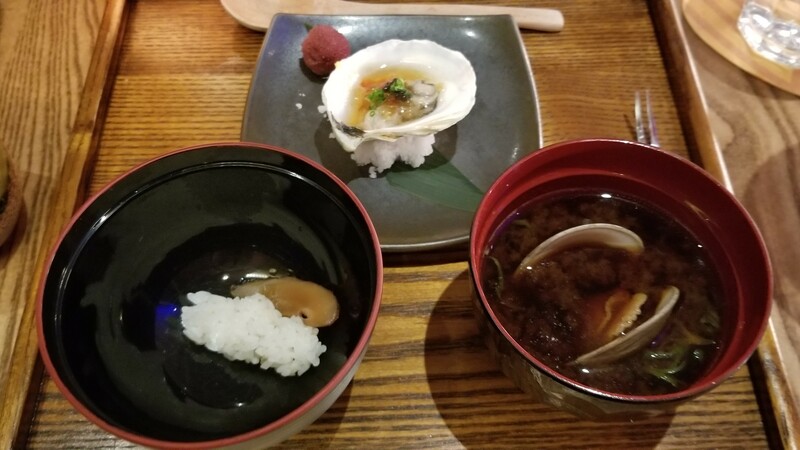 I had 5 pieces of sashimi for dinner tonight, along with a few chopstickfuls of sushi rice, and a single (very) large scallop, and I was sated. Simmer down folk. I am in NY. That sandwich was from Sullivan St. and not for sale in Boston, nor, as far as I know, a ginormous scallop. You just knew we would ask. I’m not proud to say I can pack in food too (despite my small size), but I left the meal sated. I didn’t feel like I needed to be rolled out of the restaurant, but I was not hungry and I didn’t snack later that evening. This is having a normal lunch and not 2 sandwiches before the meal.